Scientists in 2007 believed that they had, for the first time, identified an ancient graveyard for gladiators. Analysis of their bones and injuries provided new insight into how they lived, fought, and died. The remains were found at Ephesus in western Anatolia, a major city in the Roman world. Gladiators were the sporting heroes of the ancient world. Archaeological records show them celebrated in everything from mosaics to graffiti. Motifs of gladiators are found on nearly a third of all oil lamps from Roman archaeological digs throughout the empire. But how much did they risk every time they stepped into the arena? Did they have much chance of getting out alive? The discovery in 2006-2007 of what was claimed to be the first scientifically-authenticated gladiator graveyard gave researchers the opportunity to find out. The Ephesus graves contained thousands of bones. 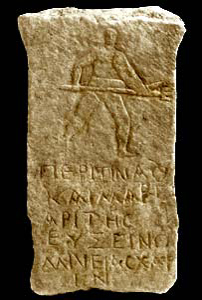 They were found along with three gravestones which clearly depicted gladiators. Two pathologists at the Medical University of Vienna - Professor Karl Grossschmidt and Professor Fabian Kanz - spent much of the previous five years painstakingly cataloguing and forensically analysing every single bone for age, injury, and cause of death. They found at least sixty-seven individuals, nearly all aged between twenty and thirty. One striking bit of evidence was that many had healed wounds. To Kanz and Grossschmidt, this suggested that they were prized individuals who were getting good, expensive medical treatment. One body even showed signs of a surgical amputation. In addition, the lack of multiple wounds found on the bones, according to the pathologists, suggested that they had not been involved in chaotic mass brawls. Instead, the evidence pointed to organised duels under strict rules of combat, probably with referees monitoring the bouts. But there was also evidence of mortal wounds. Written records tell us that if the defeated gladiator had not shown enough skill or had even shown cowardice, the cry of 'iugula' ('lance him through') would be heard throughout the arena, demanding he be killed. The condemned gladiator would be expected to die 'like a man', remaining motionless to receive the mortal blow. The pathologists discovered various unhealed wounds on bones that showed how these executions could have taken place. These were consistent with depictions on reliefs from the time showing a kneeling man having a sword rammed down his throat and into the heart. A very quick way to die. Tell-tale nicks in the vertebrae or other bones suggested that at least some of the bodies suffered this fate. A number of skulls were also found to have sets of up to three holes at odd intervals, consistent with a blow from a three-pronged weapon such as a trident. 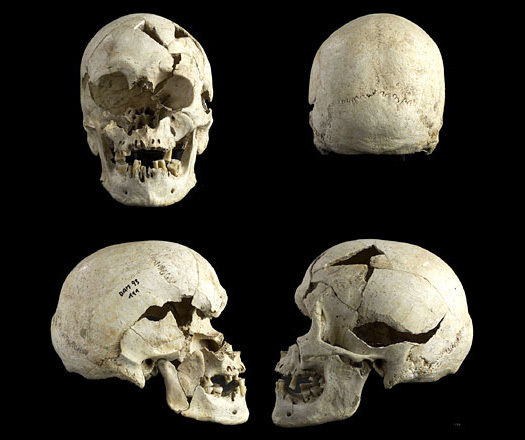 The bone injuries - those on the skulls for example - were not everyday ones. They were extremely unusual. They - and particularly the injuries inflicted by a trident - were a particular indicator that a typical gladiator's weapon was used. But not all head injuries found were trident wounds. A number of the skulls showed rectangular holes that could not have been made by any of the known gladiator weapons. Instead, they suggested the use of a heavy hammer. One possible explanation put forward by Professor Kanz, which was being supported by a number of archaeologists, was that there must have been an assistant in the arena who was there to provide the gladiator with his coup de grace. The professor assumed that they must have been very severely injured gladiators, ones who had fought outstandingly and so had not been condemned to death by the public or by the organiser, but who had no chance of surviving because of their injuries. They were delivered a final blow in order to release them. The work of the Viennese pathologists was independently reviewed by Dr Charlotte Roberts of Durham University, a leading physical anthropologist. She looked at quite a few hundred Roman skeletons. She saw examples of head injuries, healed and unhealed, and evidence of decapitations. However, she felt that this new find was extremely significant; there was nothing like it to have been found in the world. It served to dispel quite a few myths about gladiators and how they fought. If a gladiator survived three years of fighting in the arena, he would win his freedom. Those who did often became teachers in gladiator school. And one of the skeletons found at Ephesus appears to be that of a retired fighter. He was of mature age and because he was much older than the others. The scientists were able to reconstruct nearly his entire body. His head showed apparent signs of healed wounds from previous fights and none of them would have proved fatal. He lived quite a normal Roman lifespan. He most probably died of natural causes. 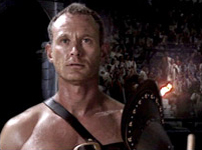 Historical records suggest a gladiator's chance of survival was slim, with some estimates as low as a one in three chance of dying each time he fought. But it appears that at least one of the Ephesus gladiators survived the odds and had a chance to enjoy his retirement from the arena.